Lucky Reptile Humus is made from natural coco humus and are designed for use as a dry or wet substrate for a variety of reptiles, amphibians and invertebrates. 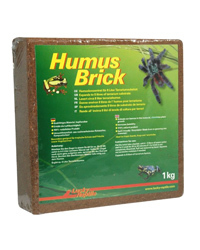 The Humus comes in a dried and pressed brick and is free from chemicals, pesticides and fertilizers. When ready to use simply break off the amount required and place in water before placing in tank. Regular spot cleans of the humus substrate will mean a complete change is required less often.